Fast position update rates contribute to high speed positioning accuracy for dynamic applications that require high speed movement of the stage. The NPC-D-6330 controller is capable of controlling up to three piezo driven actuators and two or three axis nanopositioning systems. 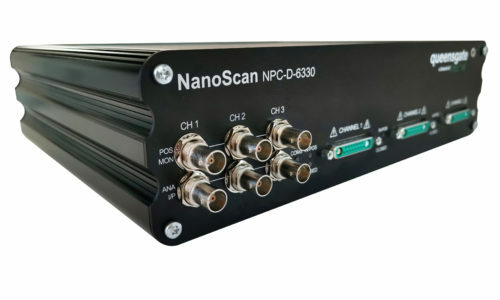 The NPC-D-6110 is a single channel version delivering the same performance for single axis nanopositioning systems. The NPC-D-6000 series Digital nanopositioning controllers deliver repeatability of movement with improved precision and accuracy for precise imaging and focusing at higher maximum speeds with fast step settle times. This can be particularly important for longer range stages or stages designed for high load bearing. Several applications and markets are benefiting from the new product including microscopy, AFM, hard disk drive testing, metrology, beam steering & nanoscale machining, showcasing the precision, accuracy and control the new NPC-D-6000 series has to offer. For more information on this and other Queensgate Instrument products please contact us.